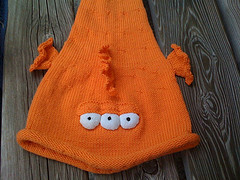 The pattern for Blinky is from ravelry and it’s just awesome. Of course in order to make it look like Blinky I had to modify it quite a bit. Row 1 [RS]: K36, W&T. Row 2 [WS]: P12, W&T. Row 3 [RS]: K13, W&T. Row 4 [WS]: P14, W&T. Row 5 [RS]: K15, W&T. Row 6 [WS]: P16, W&T. Row 7 [RS]: K17, W&T. Row 8 [WS]: P20, W&T. Row 9 [RS]: K24, W&T. Row 10 [WS]: P28, W&T. Row 11 [RS]: K32, W&T. Row 12 [WS]: P36, W&T. Row 13 [RS]: K40, W&T. Row 14 [WS]: P44, W&T. Row 15 [RS]: K48, W&T. Row 16 [WS]: P52, W&T. Repeat those short rows on the back part of the hat. Then follow the pattern. For the decreases for the fish tail I always just did a second decrease round about half and inch before the one specified in the pattern. 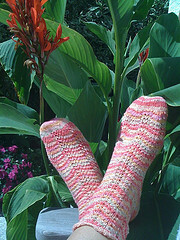 I did that till the number of stitches on my needles matched those in the pattern. Then I just continued according to pattern. 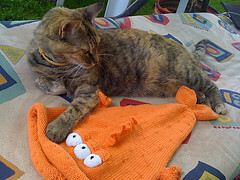 I knit the pectoral fins as specified in the pattern. Well I didn’t do the 1×1 rib, but worked in stockinette stitch. Except in the last row I increased to 40 stitches by knitting into the front and back of each stitch. Then I worked a kind of feather and fan pattern before casting off. For the feather and fan I knit *YO, K1 4 times, K 2 tog 3 times*. For the dorsal fin I also followed the pattern where the increases are concerned. But instead of doing 10 rows of 1×1 ribbing I worked k5, p2, k7,p2, k7, p2, k5 for 10 rows. 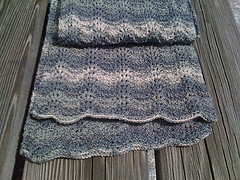 Then in the last row I increased to 60 stitches by knitting into the front and back of each stitch. Then I worked the same kind of feather and fan pattern I did for the pectora fins before casting off. 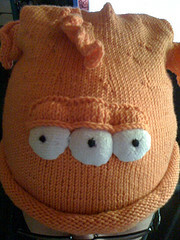 For the eyes I used these instructions… only I used an old sock as fabric for the eyes and embroidered the black dot with some left over yarn. 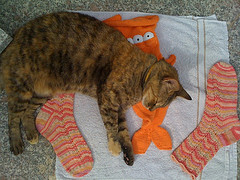 For my eyelids I cast on 20 stitches and then knit in stockinette stitch increasing by 2 stitches in every knit row till I had 26 stitches. Today LibriVox turned 6, soooooooooo…. Last week I finally finished my knit skirt and it turned out much better than expected, for I discovered halfway through that I should have used the pattern for small instead of medium. As a consequence the skirt is a little big for me… but after putting in the elastic in additon to the cord, you can barely see it. It only flares a little more. Also I modified the waistband a little. I immediately started knitting in the round and did 7 rows for the “backside”, then one purl row at the turn and 8 (or 9… can’t really remember) knit rows for the “front side”. In the 5. front row I did 2 eyelets with about 15 stitches inbetween. 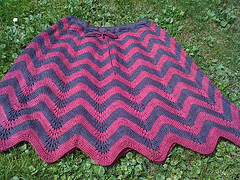 The rest of the skirt I knit according to pattern. I only had to leave out one of the D rows towards the end to make the stripes match up the way I wanted.